F. Zambelli, G. M. Prazzoli, G. Pesole, G. Pavesi, Cscan: finding common regulators of a set of genes by using a collection of genome-wide ChIP-seq datasets., Nucleic acids research 40, W510–5 (2012). This paper presents a methodology and software implementation that allows users to discover a set of transcription factors or epigenetic modifications that regulate a set of genes of interest. A wealth of data about transcription factor binding exists in the public domain, and this is a good example of a group utilizing those resources to develop tools that are of use to the broader computational biology community. High-throughput gene expression experiments like microarrays and RNA-seq experiments often result in a list of differentially regulated or co-expressed genes. A common follow-up question asks which transcription factors may regulate those genes of interest. 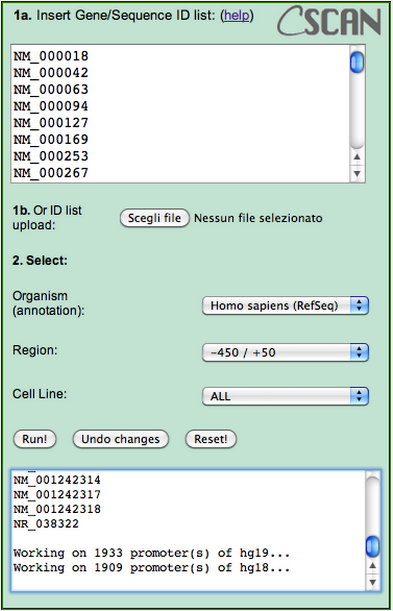 The ENCODE project has completed ChIP-seq experiments for many transcription factors and epigenetic modifications for a number of different cell lines in both human and model organisms. These researchers crossed this publicly available data on enriched regions from ChIP-seq experiments with genomic coordinates of gene annotations to create a table of gene annotations (rows) by ChIP-peak signals, with a presence/absence peak in each cell. Given a set of genes of interest (e.g. differentially regulated genes from an RNA-seq experiment), the method evaluates the over-/under-representation of target sites for the DNA binding protein in each ChIP experiment using a Fisher's exact test. Other methods based on motif-enrichment (using position weight matrices derived from databases like TRANSFAC or JASPAR) would miss DNA-binding factors like the Retinoblastoma protein (RB), which lacks a DNA-binding domain and is recruited to promoters by other transcription factors. In addition to overcoming this limitation, the method presented here also has the advantage of considering tissue-specificity and chromatin accessibility. Thanks for sharing. I've been looking for a tool to determine transcription factors eriched in a gene list of interest (from microarray or GWAS) based on the recent ENCODE data and I came across this useful post. I've tried CScan, but I don't think it corss links to ENCODE data! unless I missed it somehow. Are you are aware of any tools that does what I'm interested in ? I would also like to see a tool like this!